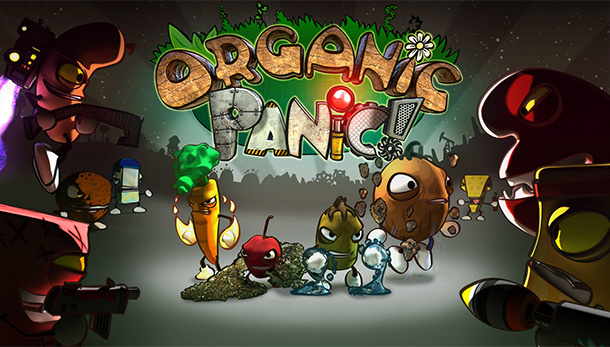 Last Limb is currently developing Organic Panic, a fun-looking physics-based platformer based entirely on weapon-wielding fruits and vegetables. The studio opened up a Kickstarter campaign not too long ago in order to obtain funding for the project and should it reach its $40,000 target the game will come to the Wii U eShop, as well as PC, Mac, Linux, Playstation 3, Vita, Xbox 360, iOS, Android and Ouya. Described as Worms meets Little Big Planet by the developer, the game sees you battle against the evil meats and cheeses as you traverse through destructible environments that feature elements that interact with each other. You play as a group of plucky pieces of fresh produce and each of them can control a particular element adding to the puzzle-based nature of the game. For example, Cherry controls earth, Kiwi influences water, Carrot has power over fire, and Coconut naturally has gravity covered - it's a bit like a fruity version of Captain Planet, only with bazookas. The Little Big Planet influences come largely from the fact you can create and share your own levels over the trusty internet, adding a whole new level of longevity to the game - if a community gets behind it of course. At the time of writing Organic Panic has 12 days left to secure the funding and any pledge at $10 or above will get you the game on a platform of your choice. Should Last Limb obtain $60,000, it will create an even bigger game with seven extra boss characters, ten new interactive materials, five new objects, at least 200 user-created levels and local co-op and versus modes. You can check out the Kickstarter video below to see more of the game in action. Will you be supporting this one? Let us know by leaving a comment. As a longtime vegetarian myself for several reasons, not only the artwork and physics engine look awesome to me. Please let this happen on Wii U. This game looks great. Wii U could use a game like this. Looks like fun, I hope it makes it on the Wii U! I am not vegetarian. @WiiLovePeace @mch A long time ago I had a game called 'meat gone bad' on an old macintosh. Now I play Super Meat Boy every now and then. Still, I feel bad when carving in Monster Hunter... And this game seems to contain more actual facts about food than the big food industry would like the consumer to know, even if it's just a cartoon-ish video game. Looks fun has heck and if the developers take there time the pad could be the best way to create the levels. Looks great. The gameplay looks like it'll translate well to the Gamepad. Looks interesting. Nice to see all of these indie games with fresh ideas at affordable prices. @Shambo Nice to see a game showed you the light Super Meat Boy doesn't count though, since that's just about a boy without skin according to the developers. That's exactly why I don't play Monster Hunter I know its just a game, but it makes me feel like a meat-eater when I played it once back in the day haha. If there had been a proper storyline to Monster Hunter I might have been able to play it. But just seeing those beautiful animals roaming around, relaxing, eating some grass, they only get disturbed because I entered their territory. It just felt wrong to me, so I stopped playing. Looks like it's going to be a great game. I love that its a combo between worms and little big planet. That should make for some really fun gameplay. The characters are really cute too. I am also a vegetarian, but with meat. Looks decent but i'm really getting tired of seeing " Insert game name here Could Come To Wii U if Kickstarter Goal is Reached". Blah. Blargh! Kinda interested in this one but not really. Looks cool, but I'm somewhat disappointed that there's not a level (yet) inside of the body. Veggies vs. junk food battle inside of a rumbling stomach. Makes more sense than fighting on a volcano or whatever. Looks pretty cool! But I don't see why sooo many indie developers show interest for a console that doesn't sell, while at the same time no regular developer want to develop for Wii u! If this goes on Nintendo can say one day: We have the most downloadable games...but sadly there's no-one around to download them!! Don't get me wrong: Every cool game is highly appreciated! But I can't live on short (and expensive) downloads alone! I need GOOD, RETAIL third-party games on Wii u! !